It’s been a little over four weeks since Bell’s held the most fun I’ve ever had at a beer fest. The Bell’s Funivitational brought in so many great beers from so many great breweries that we don’t have access here to in Michigan. Because there was so many amazing out of state beers, I only had one or two from local breweries, but there was something that caught my eye that I didn’t expect. As I was walking around Homer Stryker Field with my little book of beers, I noticed a sign for a brewery in Decatur. I had never heard of the place before, so I checked their website real quick, noticed they had a food menu, and did my best to remember the place when it came time for a night out with J. 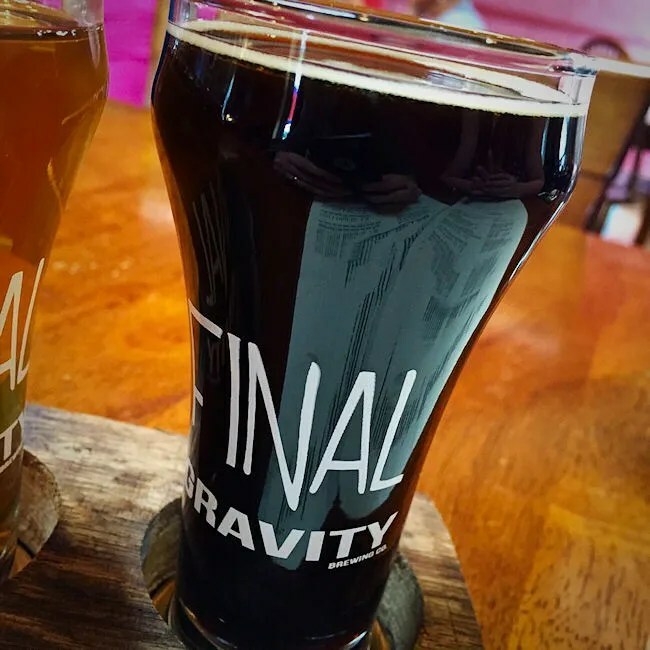 The brewery is Final Gravity Brewing Company and it’s on Phelps Street in downtown Decatur. It’s kind of a spin-off from Patchwork Brewing Company. 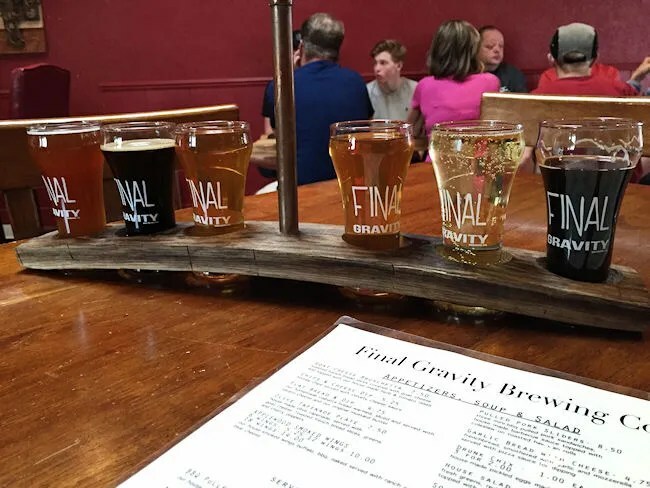 The father and son that are Final Gravity helped the owners of Patchwork and eventually took it over when she stepped aside to focus on her family. The brewery shares a building with Harley’s Gentlemen’s Club right on the corner of Phelps and Delaware Streets. I thought at first there was a parking lot next to the building, but that turned out to not be the case, so we drove around the block and found street parking a little bit further down Phelps Street and walked back. 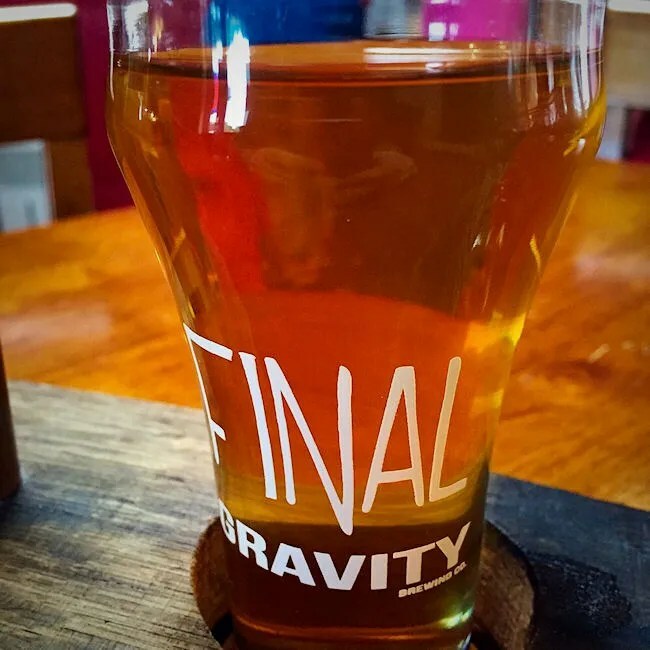 Final Gravity is not a big place. 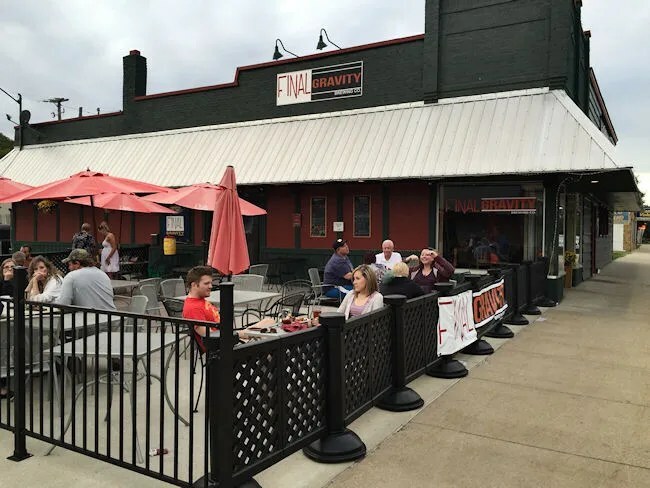 They have a small tap room and a large outdoor patio. Inside, there are only about half a dozen tables. Luckily, there was a four top pub table open when we walked in. It was a nice night out, but we’re not really patio people. The lone waitress saw us sit down and asked from the bar if we needed menus. We said yes since food was the main reason for our visit. The beer is just always a bonus for me. I decided not to make a decision on beers and just ordered a flight. They have six beers on tap and a cider. They had just blew the keg on one of the beers, so the waitress offered me the cider as part of the flight so I’d have all six glasses. I started my flight with the Eye Opener. This is a nice little Imperial Stout with a little more of a coffee flavor than chocolate. I think I would really love this one as a Bourbon Barrel Aged stout. The second glass I picked up was the Hard Cider. This was a very sweet, very light, very crisp cider offering. J snuck a quick sip of it and wished she could have done a whole glass. 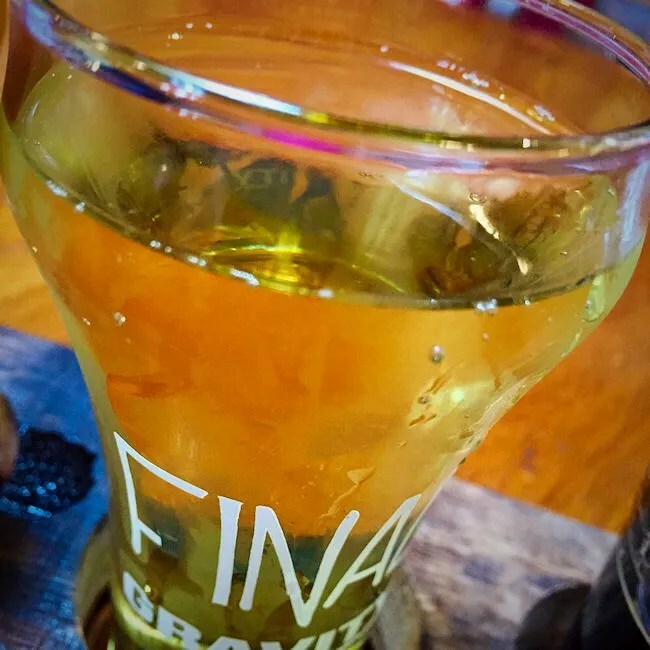 It’s the kind of cider that’s right up her alley. Beer number three was Pumpkin Carver. 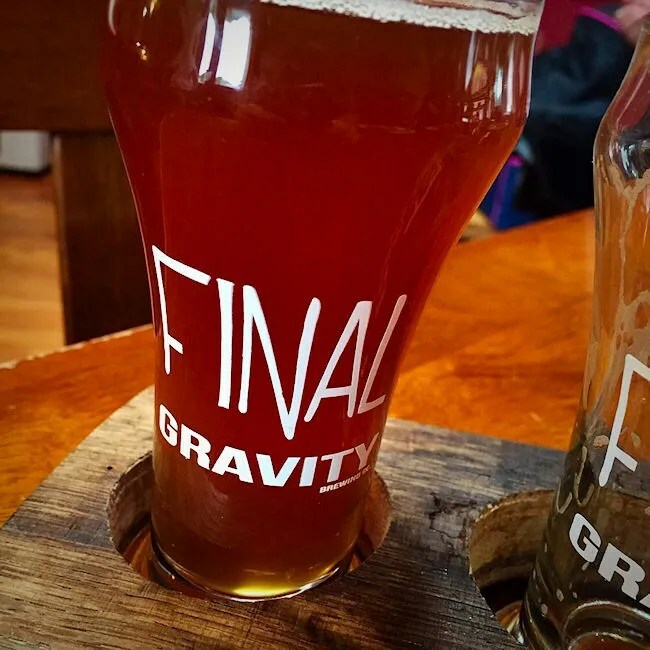 As the name implies, this is Final Gravity’s pumpkin beer offering. I didn’t realize at first that it was even a pumpkin beer. It had a very light pumpkin taste, but I had to be aware that it was a pumpkin beer in order to recognize it. 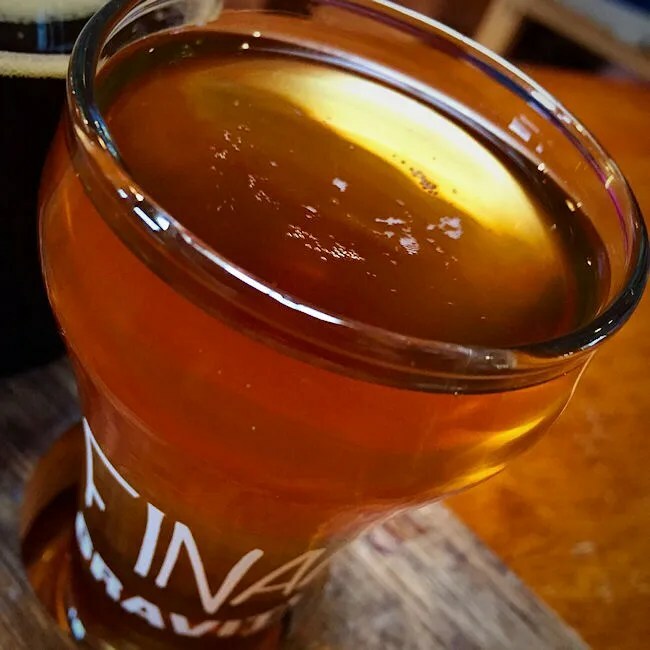 That’s not necessarily a bad thing…some pumpkin beers go too far the other way. This one was nice and subtle. Fourth beer was Uranus on Fire. This one is branded as a fruit beer, but it’s actually an Amber Ale with jalapenos. The beer has that great pepper flavor from the jalapenos, but it doesn’t have a lot of heat. I overheard one of the brewers telling another table that they’re working on different versions of this that bring the heat….they just brewed this one for that great pepper taste. Beer five was Quick 3 Some. It’s a Strawberry Porter, but like the pumpkin beer, it’s not an overly strong strawberry flavor. The smoothness of the porter still shines through with just a little bit of sweetness from the berries. The last beer was my favorite. I always save the IPA’s for last because those are almost always the ones I enjoy the most. 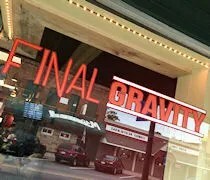 Final Gravity’s offering that night was Radioactive Knife Fight. This delicious IPA isn’t too heavy coming in at only 7.0% ABV and it has a really strong fuity aroma. I liked this offering a lot and would be my go-to if I was a regular. Now, on to the food. We decided to start with an appetizer because turning down smoked wings is just stupid. We put in an order for six Applewood Smoked Wings. We had asked for them as Garlic Parmesan Wings but got them naked. That was fine because if we’re going to get the wrong ones, I’d rather them come naked. They were still very delicious. They were tender, juicy, and had a great smoky flavor all the way down to the bone. J and I each had three and it’s quite possible we both could have made a meal just out of these wings. For our meals, we both ordered sandwiches. I ordered the BBQ Pulled Pork sandwich. Like the wings, the pork is slow-smoked right outside of the brewery with apple wood. 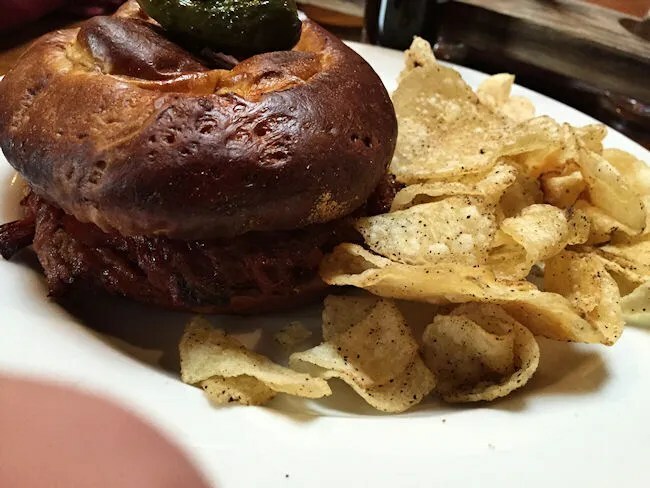 It’s tossed in a sweet BBQ sauce and served on a toasted pretzel roll. The sandwich also comes with slaw, but I asked to leave it off. The pork was very tasty. I tend to lean towards pulled pork sandwiches without much sauce, but this one was good. There was some spiciness coming from somewhere. I don’t know if it was the pork rub or the sauce, but this sandwich had a little kick to it and I loved it. The toasted pretzel roll was perfect for this sandwich. It held up to a saucy mess and didn’t fall apart when I needed it to hold together. J’s selection was the Grilled Ham & Cheese with Tomato. This sandwich was mostly ham as the Virginia Ham Slices were piled high on the toasted sourdough bread. 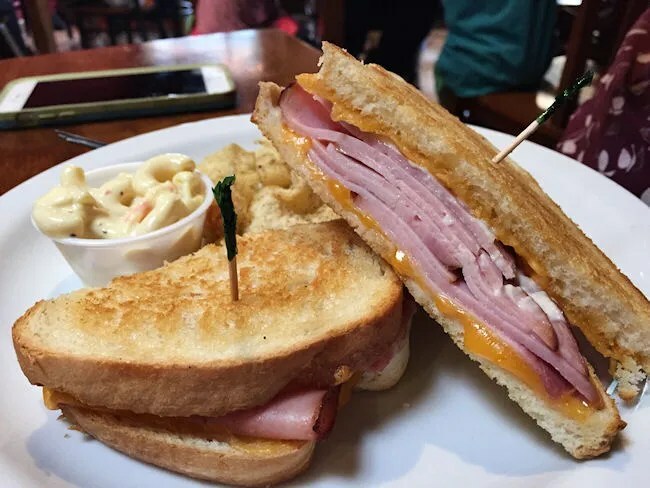 There was also slices of sharp cheddar and tomato between those slices of bread, but you better like ham if you order this one. J tends to not like a lot of meat on her sandwiches, but she seemed alright with this one. She kept saying she really enjoyed her sandwich which I was worried about when I saw it come out of the kitchen. The sandwiches come with chips although J opted for a macaroni salad instead. I stuck with the chips and took the salt and peppers ones which were one of a couple that were offered. Our bill was right around $40. Both the beers and the food were delicious. Our only complaint was the speed of the service, but they have a very small kitchen and only one waitress. On this night, it wasn’t an issue. We were without L and were actually just enjoying the time, but there were families around us with kids and J just kept saying she was glad we were by ourselves as keeping L entertained while we waited would have eventually became an issue. Still, that’ nothing that should keep you away, just an observation. 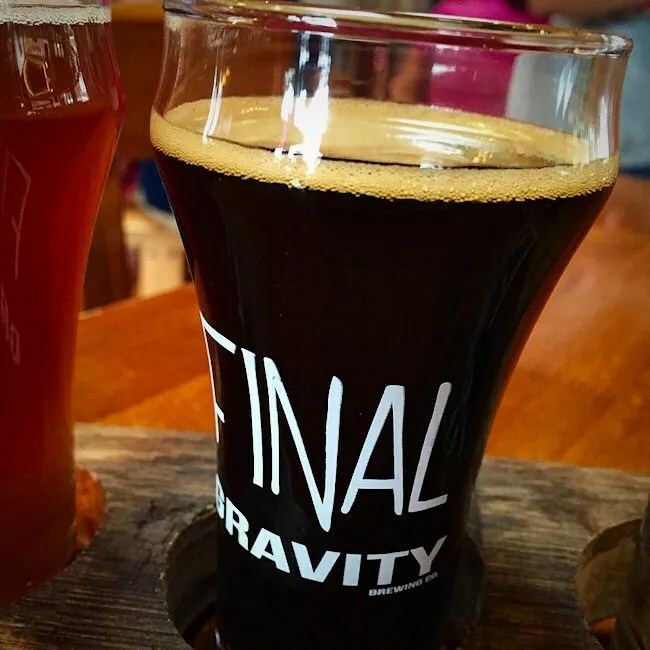 Final Gravity is only a short drive from Kalamazoo and it’s one of those places that’s worth the drive….so make it.